Make Stunning Jewellery From Bad Acrylic Paintings! 11th August 2017 by Gilly·Comments Off on Make Stunning Jewellery From Bad Acrylic Paintings! You know all those bad acrylic paintings you have? This is what you can do with them - make Jewellery! Yes. Really. Come on - admit it, you have a stack of acrylic paintings you don't know what to do with. You've had a go at acrylic pouring and failed to produce that masterpiece - right? But there are itty bitty areas that you quite like. So how do you show them off? Last week I came up with an idea involving ripping the canvas off the frame and making journal covers with them. This week I am using the scraps from the same acrylic poured canvas to make beautiful jewelry from the teeny areas of the painting that looked pretty. My bad painting will not be in vain! You can see the video on how to make these acrylic pour pendants here. An acrylic painted/poured canvas that you can take off the frame and cut up. A 1 inch round hole punch. Some pendant trays (also called bezels). Some split rings (if the bezels don't have built in loops to thread the chain through to hang the right way). Some card to punch out and line the bezels with (optional). PVA glue, double-sided tape or large glue dots. 1 inch/25mm Glass domes or epoxy resin sticky backed domes. Chains to hang your pendants on. Shop around on line to find the best deals for the pendant trays, glass domes and epoxy resin stickers. 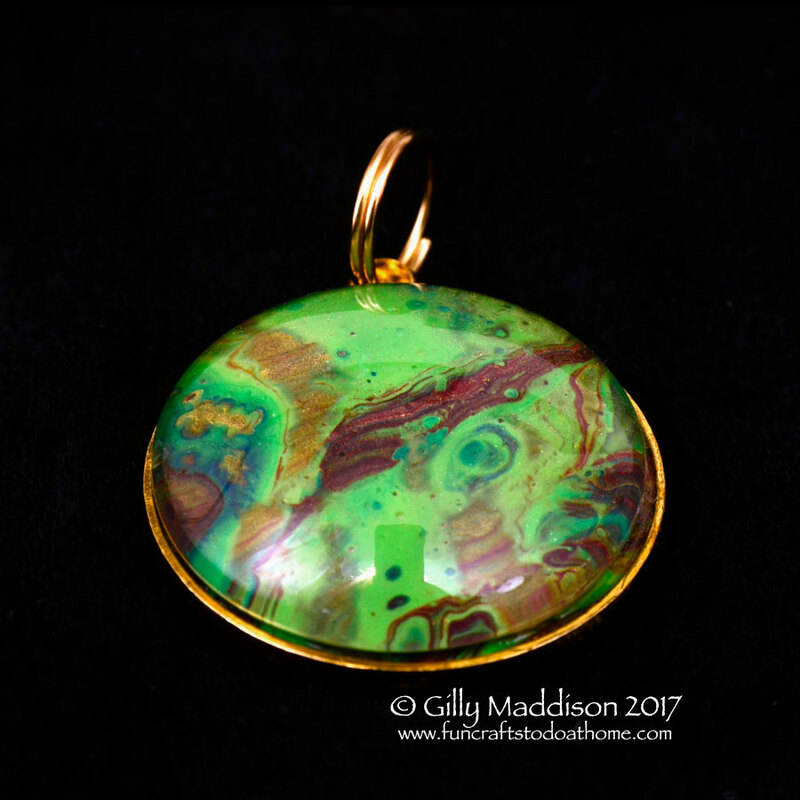 And have fun creating your acrylic pours, safe in the knowledge that if they don't work well, you can make beautiful jewellery from the best bits! Next Next post: Easy To Make Glass Pendants – No Bezel or Tray Needed!